Oral and Maxillo-Facial Surgery is the specialty concerned with the treatment of the mouth, face, neck and all associated structures. Oral and Maxillo-Facial Surgeons are medical professionals that have qualified in both medicine and dentistry. This provides the specialist knowledge to perform facial procedures pertaining to the mouth, the jaw and facial regions. Mr Mahesh Kumar quailified in dentistry in 1990 and later in 1998 qualified in medicine from Kings College in London. Mr Mahesh Kumar has worked in hospitals across the country and with his background in medicine and dentistry, he has specialised in the area of Oral and Maxillo-Facial Surgery. 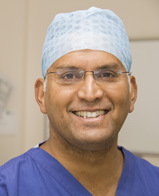 Mr Mahesh Kumar currently holds posts as a consultant at Hillingdon and Northwick Park hospitals and is an honorary consultant in head and neck surgery at the Ealing and Charing Cross hospitals. If you would like further information or advice, please contact us for a consultation via the details listed on this website. You guys have been brilliant. Thanks. Very satisfied with treatment, care and after care follow up by the doctor's PA. Thank you for your help, support and advice. Excellent service, I would have no hesitation in seeing Mr Kumar again. An exceptionally competent, courteous surgeon.